This people-oriented dog originated in Ireland, and has a reputation for being a bit ‘easier to handle’ than other terrier breeds. But what’s the best dog food for Wheaten Terriers? What do you feed a small dog that’s also super-energetic? Here’s what we found out. How Many Calories Does A Wheaten Terrier Need? Wheaten Terriers grow to a height of about 1 foot, 6 inches, and end up weighing somewhere between 30 and 40 pounds. They’re definitely a smaller-sized dog—but don’t make the mistake of thinking that they don’t make up for their small size with a big personality! They make excellent family dogs, and can be just as lazy as they are energetic (if being lazy means sitting on your lap while you’re relaxing, anyway). But they still need adequate nutrition and a diet of healthy foods to keep them perky, happy, and going strong. A less active dog of this breed will need about 700 calories per day, while a moderately active dog will need about 880. If your Wheaten Terrier tends to be exceptionally energetic, or gets a lot of exercise on a daily basis, however, then you might need to feed it quite a bit more—even as much as 1,400 calories per day! This video from the very popular Dogs 101 series does an awesome job of discussing the basics of owning and caring for a Wheaten Terrier. If you have one or are thinking about getting one, then I would definitely recommend that you check it out. 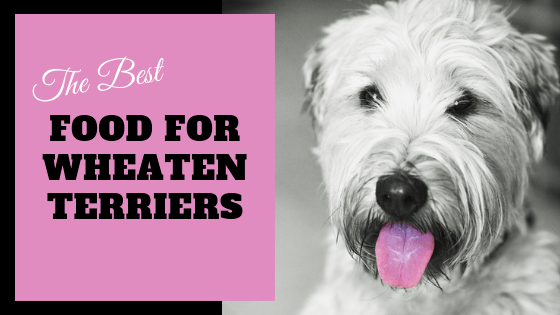 Like most other dogs, Wheaten Terriers need a diet that’s rich in nutrients, vitamins, and minerals to provide them with the stamina and energy to get through the day. A diet that’s rich in antioxidants and probiotics is also important to this breed, as these components help to promote better digestive health. A grain-free dog food is probably best for this canine, as it’ll help to keep over-processed foods out of their diet. Meat-based protein is a better bet. A food formulation that provides some quality sources of Omega 3 Fatty Acids will also be beneficial to the Wheaten Terrier, as this will help to prevent some of the more common diseases that can afflict the breed. Some exercise during the day is also healthy—so make sure to take your dog on one or two walks every day. Outdoor playtime will keep your pet occupied and make time at home that much better. But still, with that being said, they do occasionally end up sick. Wheaton Terriers don’t always end up with all of these conditions—though it is a good idea to be aware of them, just in case. These are just a few of the most common ailments that tend to affect this small, affectionate dog breed—but none of them should be taken lightly, and a visit to the vet is definitely in order if you feel that your dog may be suffering from any one of them. This condition is caused by an insufficient production of the adrenal hormones. Some symptoms of the disease include vomiting, low energy, and a poor appetite. Making sure that your dog gets a complete and well-rounded diet filled with essential minerals, amino-acids, vitamins, and omega oils is very important for the prevention of Addison’s Disease. Limiting the amount of processed food that he or she consumes can also play a beneficial role. Check out this article for more information about the condition. This condition involves the loss of excessive amounts of protein and plasma through the gastrointestinal tract. Some symptoms of the disease include increased urination, diarrhea, swelling in the abdomen, and increased thirst. It’s said that a low-phosphorus diet will help to control this condition. This website has a lot of excellent information on this and other related conditions. To learn more about this relatively complicated disease, I would definitely recommend that you check it out. This disease causes the kidneys to develop abnormally. It can lead to pretty serious complications, including early renal failure. Some symptoms of the condition include poor appetite, vomiting, increased urination, and frequent urinary tract infections. According to this article, which was published by petcarerx.com, dogs suffering from Renal Dysplasia can benefit from a diet that’s easy to metabolize and low in salt. By the 4th week of life, Wheaton Terrier puppies should be at least mostly weaned onto a solid diet—though they should be at least 8 weeks old before being relocated to their new adopted home. Pups of this breed will generally weigh somewhere between 4 and 7 pounds at the 8-week mark—and will need about 220 calories (or somewhere close to that) to stay energized and healthy. Socialization is very important for Wheatens, and good dog breeders will make sure that the puppies get plenty of playtime with both other dogs and humans over the course of their development. This will teach them crucial social skills that they’ll need later on in life. It’ll teach them how to get along well with other pets, and will also improve their interactions with humans. When properly socialized, Wheaten Terriers make adorable and loving pets—so make sure to choose a breeder who knows what they’re doing before adopting a puppy. There’s no shortage of quality dog food choices on the market today—but in our minds, a dog food needs to be specifically well-suited to the breed to quality as the best. The ideal food will go above and beyond to give the dog what it’s going to need to stay healthy, happy, and active—which is why we’ve chosen Natural Balance Chicken & Sweet Potato Grain-Free Dry Dog Food as the number-one choice for Wheaten Terriers. First of all Natural Balance is grain-free—which means that it’s easier to metabolize. This will make it better for Wheatens with a disposition for Renal Dysplasia. Secondly, it’s filled with quality sources of Omega 3s—like Flaxseed and Salmon Oil. 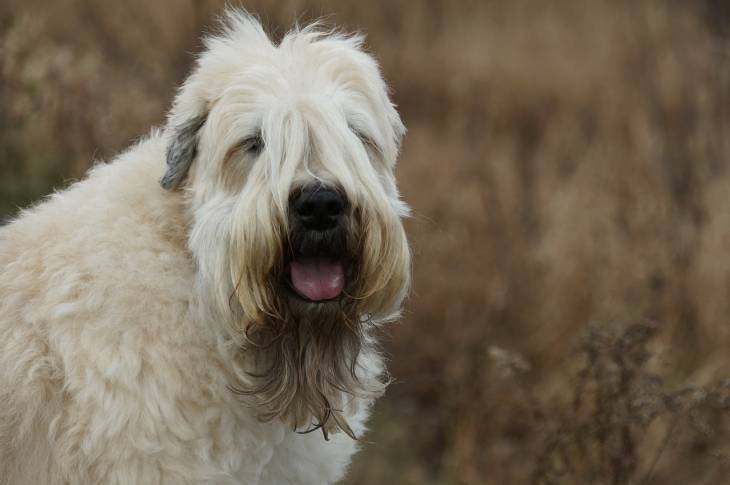 This will help to prevent conditions like Addison’s Disease, which is more common among Wheaten Terriers than some other dog breeds. Thirdly, it contains quality source of meat-based protein like chicken meal, which will give your dog a ton of energy and stamina without loading it up on grains or fillers. If you’re looking for a top-notch dog food formulation that’ll give your Wheaten Terrier everything he or she needs to thrive, then there’s a good chance that you’re going to love Natural Balance Chicken & Sweet Potato Grain-Free Dry Dog Food. From the quality meat-based protein, to a high concentration of Omega 3 Fatty Acids, to its easy digestibility, this is a kibble that your canine companion will love you for! Best Dog Food for Pekingese: Keep that Coat Fresh!